Artist Rafael Lozano-Hemmer's presented the world premiere of his ground-breaking marvel Pulse Front, a spectacle of lights controlled entirely by the heart rate of passers-by. Rafael Lozano-Hemmer was born in Mexico City in 1967. In 1989 he received a B.Sc. in Physical Chemistry from Concordia University in Montréal, Canada. 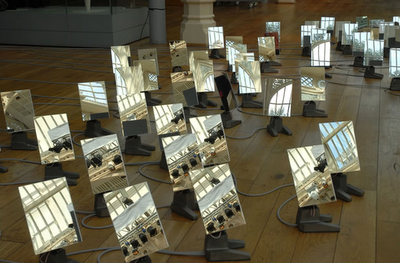 Rafael Lozano-Hemmer develops large-scale interactive installations in public space, usually deploying new technologies and custom-made physical interfaces. Using robotics, projections, sound, internet and cell-phone links, sensors and other devices, his installations aim to provide "temporary antimonuments for alien agency". Ou comment récupérer deux anciens projets pour en faire un nouveau! Pulse Front est ainsi le mélange de Relational Architecture #4, Vectorial elevation (dans la série des Relational Architecture de Lozano-Hemmer, datant de 2000) et d'un projet plus récent, Pulse Room, présenté lors de la Biennale d'Art de Venise en 2007 (voir ci-dessus pour les liens vers ces projets). 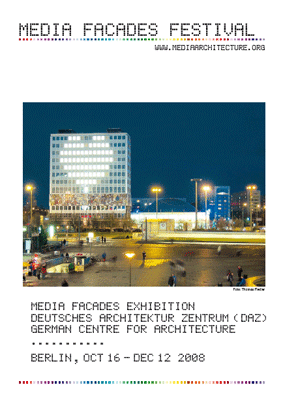 The documentation of our Media Facades Exhibition Berlin 2008 is now available. including all exhibited projects and an extensive introductory text by the curator Gernot Tscherteu about MEDIA FACADES: FUNDAMENTAL TERMS AND CONCEPTS. for more info [click here]. Royal Opera House: Audience. from rAndom International on Vimeo. Video production by Splitframe. Art Direction by Jem Grim. Une forme interactive vue et revue souvent pour des installations "Media Art" (tracking camera). Peut-être un peu plus réussie et ludique ici avec l'usage de miroirs robotisés qui renvoie à un certain egocentrisme (narcissime ? 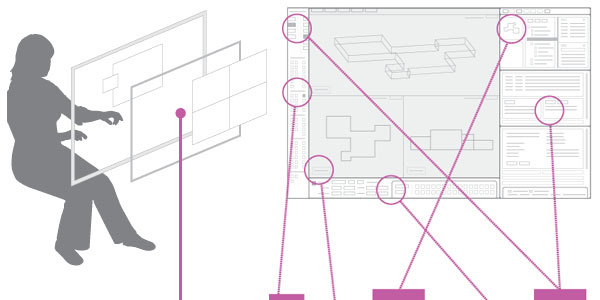 ou "user-centered") d'un grand nombre de formes interactives. Reste qu'on frise presque l'indigestion ces temps avec l'usage (rendu visible) du tracking video dans les projets "Media Art". 100 Ideas for Envisioning Powerful, Engaging, and Productive User Experiences in Knowledge Work [flashbulbinteraction.com] is an online reference for product teams creating new applications for work involving thinking, with a heavy emphasis on visualization in the example domains used throughout: Clinical Research (data analysis visualization), Financial Trading (market analysis visualization) and Architecture (building information modeling visualization). Specifically written for use during early, formative conversations, it provides teams with a broad range of considerations for setting the overall direction and priorities for their onscreen tools. The ideas and illustrations in the "Enhancing Information Representation" and "Pursuing Aesthetic Refinement" sections are especially relevant to this blog's focus. The work is freely available by the creative commons license as a browsable website, as a set of highly summarized idea cards (PDF), and as a printable 143 page book (PDF). See also Visualizing Information for Advocacy. Une sorte de "Neufert" (cf. lien coi-dessus) des interfaces destinées au travail (work mediation interface). The Emergence Project [emergenceproject.org] is a "software art" installation exhibited at Hyde Park Art Center's digital building facade gallery. It is based on the ideas and textual discourse that emanated out of the Chicago Humanities Festival: its presentations, performances, and panel discussions were captured, analyzed, and processed into a set of dynamic data visualizations that evolve dynamically over time. 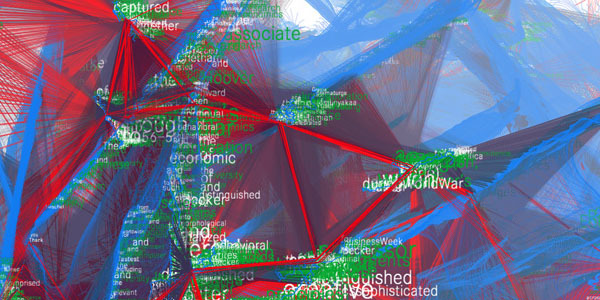 The generative data artwork uses simple morphological rules to animate word clusters, based on linguistic proximity, similarity, and difference. It deliberately utilizes computer-generated animation to chart how complex patterns arise out of a multiplicity of simple interactions, a phenomenon known as "emergence". Cela rappelle certains projet de Ben Fry autour de l'analyse de textes. C'est déjà vu, sous une esthétique générative, mais reste intéressant au niveau de l'analyse de textes et dans ce cas précis, de discours. Voir aussi à ce propos un précédent post relatif aux élections américaines.